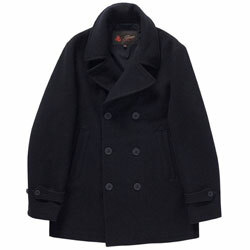 Most good quality pea coats from a heritage maker will set you back £160 upwards. You get what you pay for – but if that price is a bit rich for you, Topman currently has a pea coat for just £70. In terms of look, it’s not very different from some of the classic models – six anchor buttons, buttoned cuffs, handwarmer pockets and a collar that can be fastened as a funnel neck. Obviously, it’s not all wool for that price – but it is 72% wool and machine washable. Also available in a grey tweed design, it’s certainly worth a look if you’re investing in a pea coat this winter.